Megan’s interest in beekeeping began as a young child on her father’s dairy farm near Delhi, New York where they kept beehives behind the sugar shack. After moving back to Woodstock, New York she knew the first project for the property was a bee yard and she’s been hooked on beekeeping ever since. She’s been working in the bees for ten years now. During the spring and fall she loves to spend time in the forest hunting wild honeybees. With the help of Jorik’s queen rearing expertise she introduces their genetic potential to her own bees. With Jorik she runs hundreds of hives, teaches at the shop and sells honey, bee packages and nucs. Her goal in starting HVBee was to create a hub of resources for local beekeepers and help grow a strong and sustainable beekeeping community in the Hudson Valley, New York. Jorik began his fascination with bees when he installed his first seven colonies in hives of his own making. Since then, his fascination has grown into a passion and full time business. His first years were spent learning to divide his large colonies into smaller nucleus colonies. 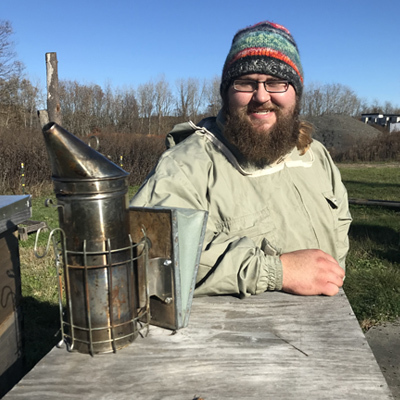 Eager to expand his rapidly growing hobby, he began queen rearing and seeking out different races of bees and becoming familiar with their traits. He began focusing on the ones with favorable attributes and best suited to the northern region, all the while broadening the genetic diversity of the stock in his apiary. Part of his growing business included removing bees from old barns and farm houses near his home in Huntersland, New York. He started noticing a recurring story of how these wild bees had lived on their own for decades in these buildings. It seemed only logical to incorporate these feral, survivor bees into his genetic pool, which he continues to do. With Megan he now runs hundreds of hives, teaches, sells nucs, honey and queens. Charlie has been with us for a good long while now. His journey into beekeeping came one day when he asked Jorik “Hey, can I come help with the honey sometime?” and he’s never looked back. He maintains his own home beeyard, has two outyards and helps us in every way with the HVB beeyards. Charlie, his wife Katie and their kids Marley and Warren are working on their own homesteading dreams. Charlie sets a high bar for all of us at the shop with his cheerful banter, always present smile and mad skills at the farmers market.